7/26/11 – Yesterday was pretty full and today we needed to make some miles. 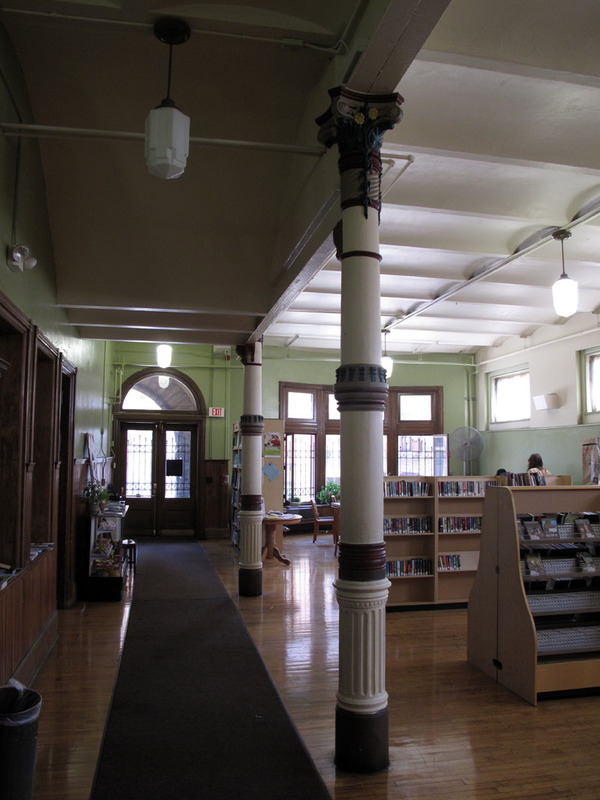 The tiny library in Brownsville, PA had massive columns in front that had been recycled from a bank when the bank went under during the Great Depression. Despite how bad things were here now the librarian said that the library had survived the Depression and she vowed that her library wasn’t going to close now. The Carnegie library in Connellsville, PA was still impressive despite its faded condition. We proceeded along one of the great drives of the trip through southern Pennsylvania, northern West Virginia and into Maryland and Virginia. We were in the cradle of the Civil War. We ended our long drive in the beautiful farm country around Harpers Ferry, WV. 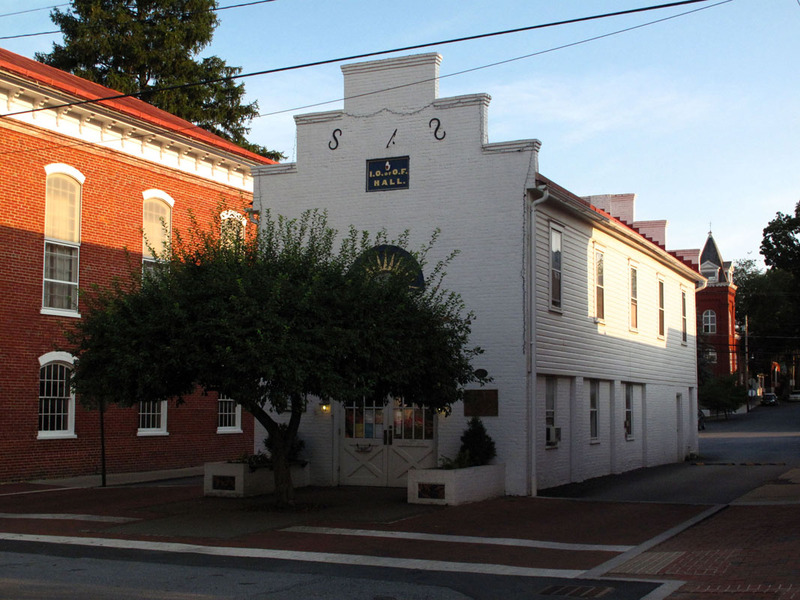 Our last library of the day was in Shepherdstown, WV and it was one of the best so far. 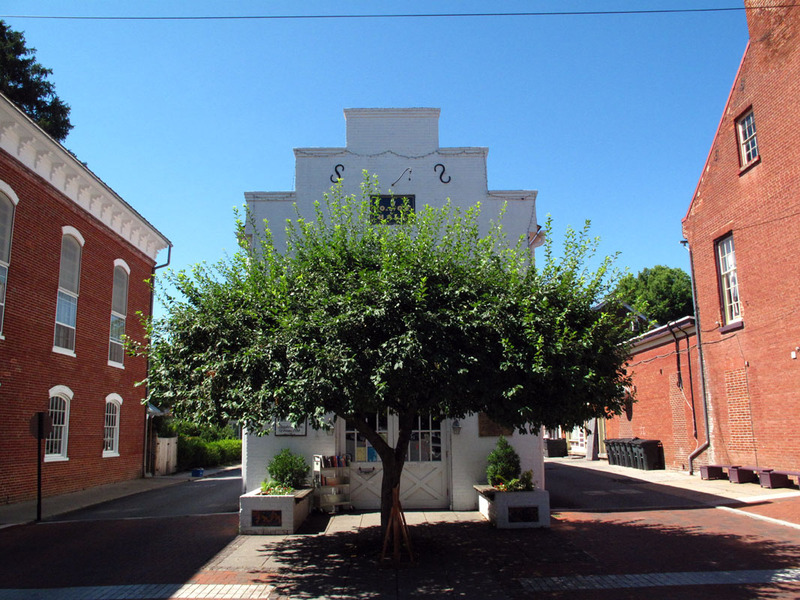 It is a unique small building nestled between two taller brick buildings and two streets. We found out later that it had been a market that opened up on to the streets. We drove through Harpers Ferry and felt the full impact of the Civil War in this historically important small town. 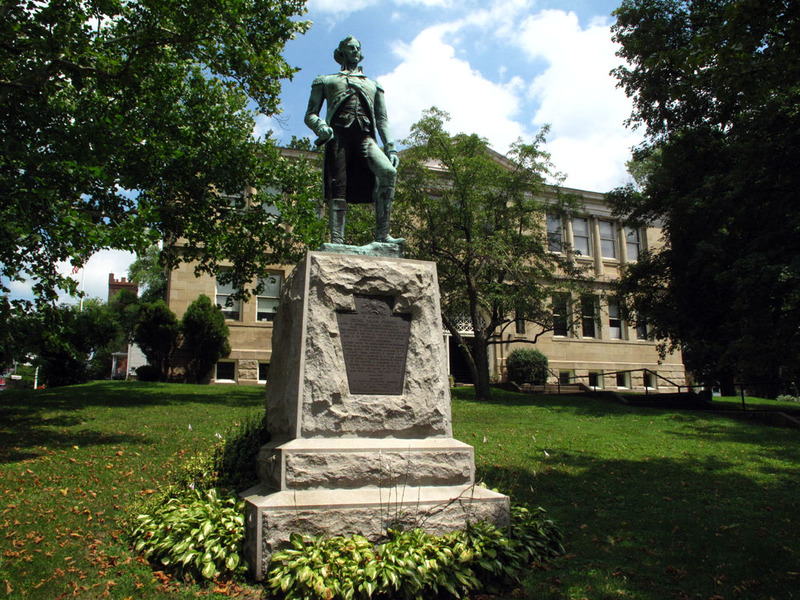 7/27/11 – Shepherstown was so interesting that we went back again to photograph in the morning light. We also met the delightful librarians who told us the story of this special place. So much history has occurred in this area. 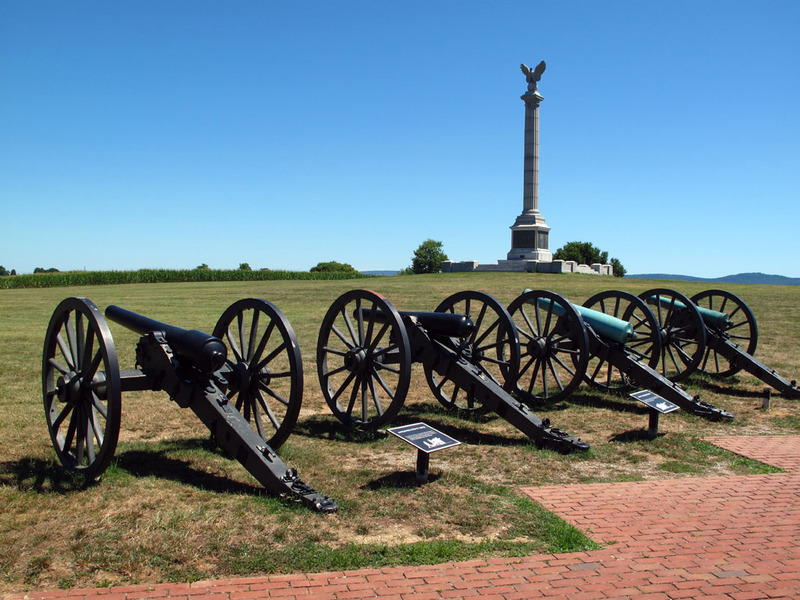 The National Historic Park in nearby Antietum was a moving memorial to the devastation of that Civil War battle. President Lincoln used the partial success of this battle to declare the Empancipation Proclamation and to prevent England from recognizing the Confederacy. We also stopped at another Civil War battle site in Sharpsburg. I photographed the library there which had several war memorials on the front lawn. 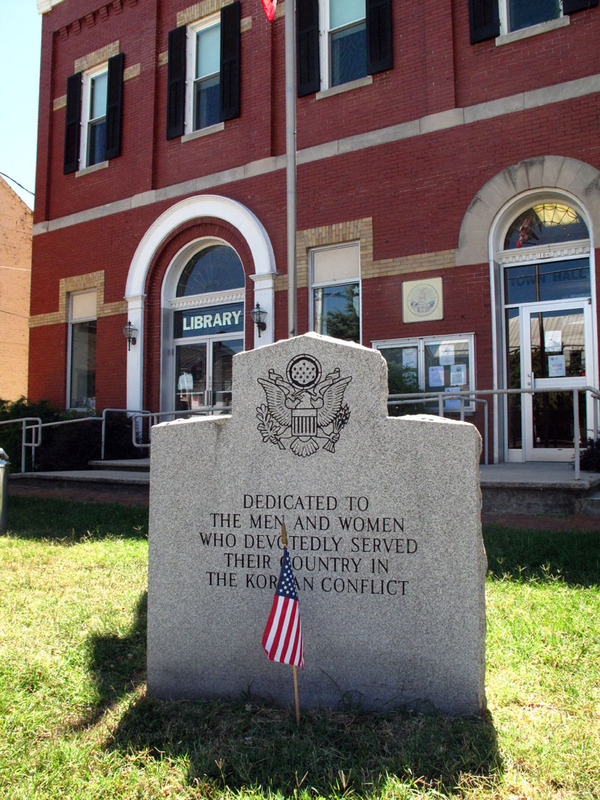 Again, libraries function as a center for memory including the memory of fallen soliders from the past and present. 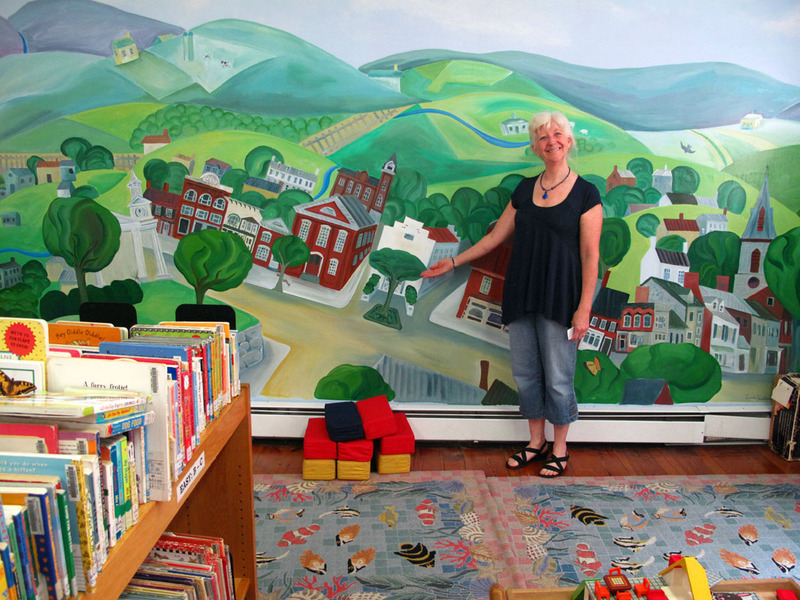 We drove to Winchester, VA to photograph the Handley Regional Library. 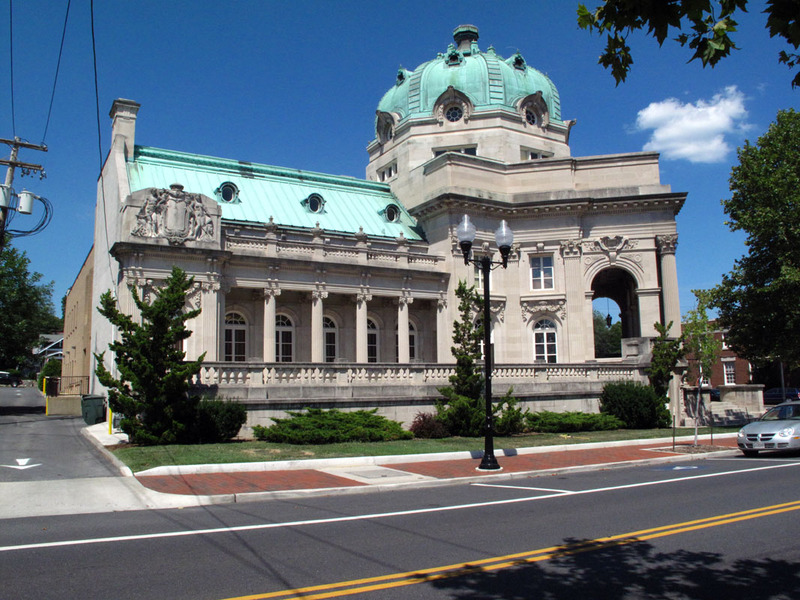 It is a stunning piece of architecture built by a Confederate sympathizer after the war. I was surprised to see several portraits of Confederate heroes in the library and wondered what the African American patrons thought when they saw these paintings on the walls. After the town of Leesburg, VA we feel ourselves getting sucked into the vortex of Washington, DC. In some ways our trip ended as we drove to the Capitol Mall to pick up our friend Jeff Gates and his daughter Lilly. 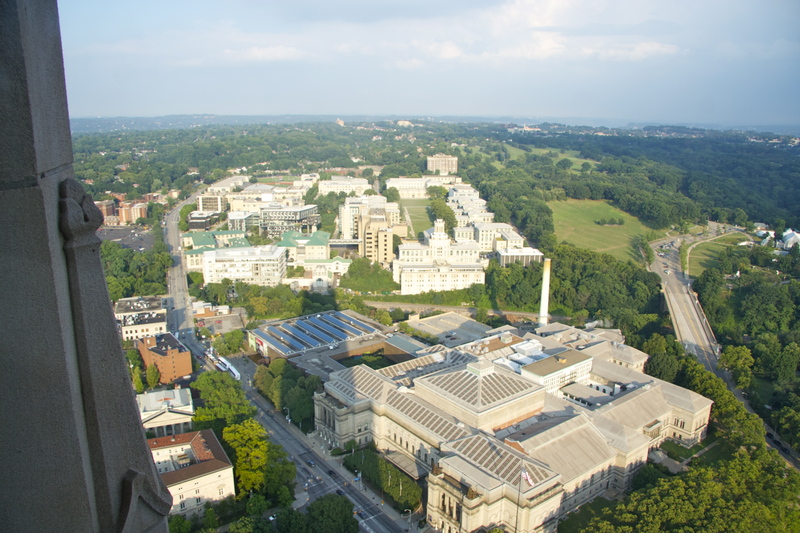 Although we still have many more days left on our trip there was a sense of completion having crossed the country and arriving at our nation’s Capitol. a green library. The Shaw branch library is also new and, as we have seen across the country, filled with people. 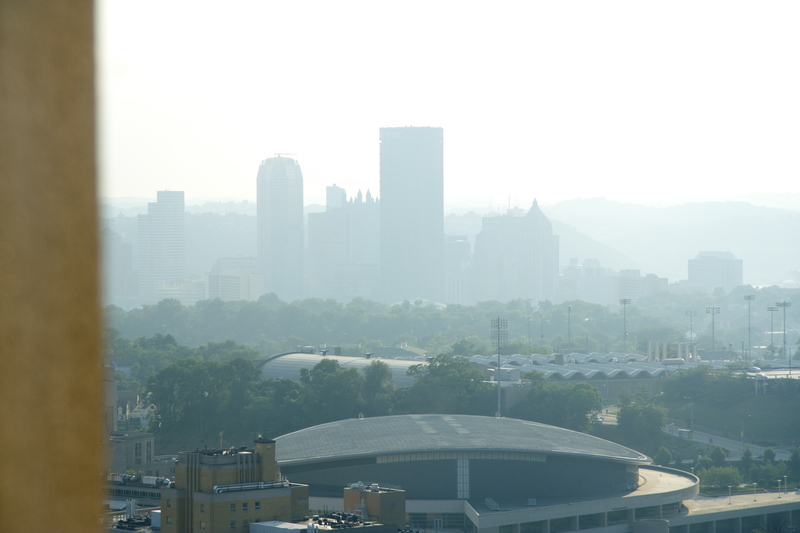 7//25/11 – Pittsburgh, PA is a unique city. Situated at the junction of three rivers it has mountains, cliffs, cable cars, a hip European feel. It is both old world and also a city reinventing itself after its economy collapsed in the 1980s. 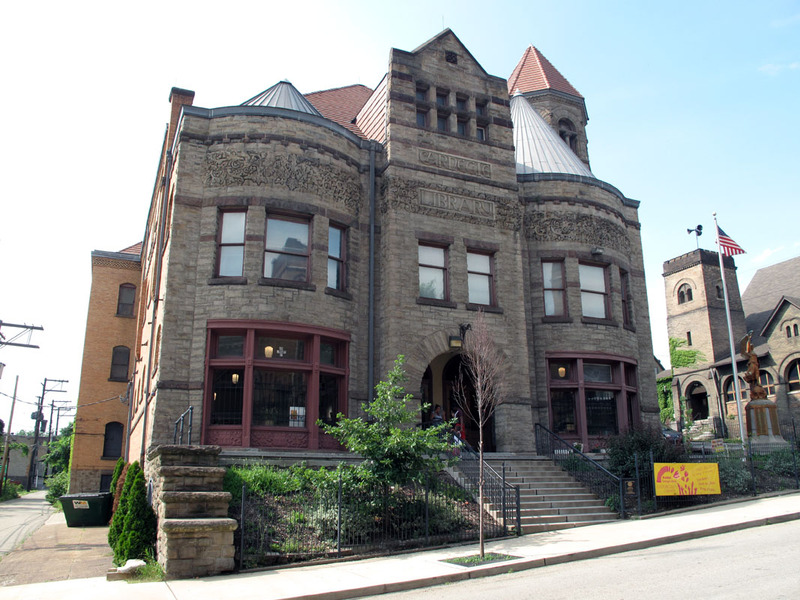 The Pittsburgh area was where Andrew Carnegie built his first libraries in the U.S. 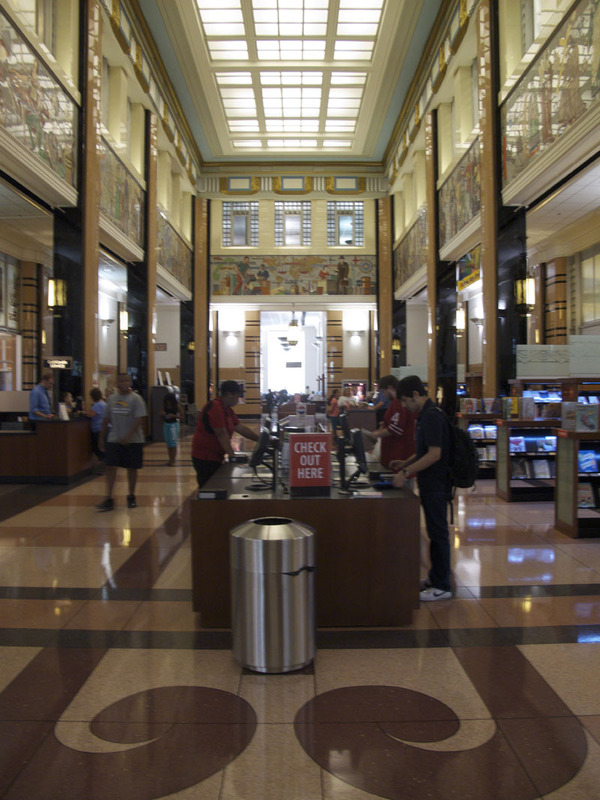 These libraries were the beginning of the 1,600+ library system he built nation-wide. Because they were the first he built them in ways very different from the later Carnegie libraries. They originally were built for his workers to have a place to relax, recreate and to better themselves through lecturers, performances and, of course, books. 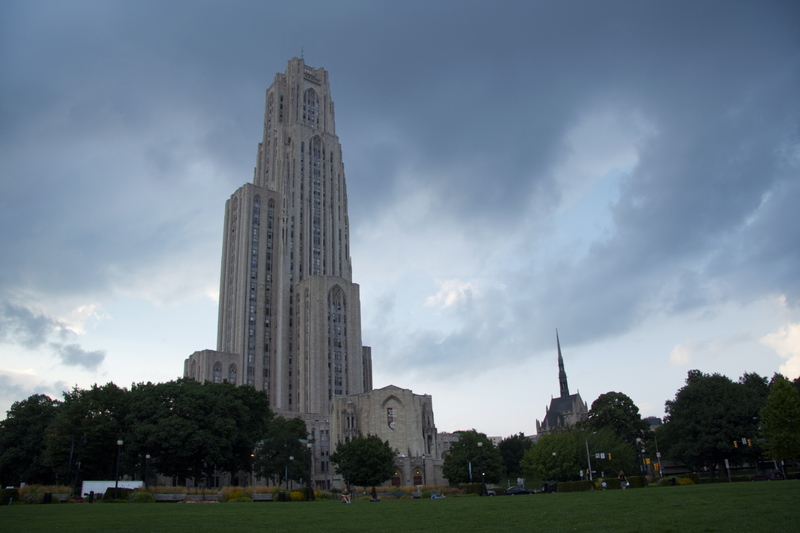 Carnegie himself, as a young lad from Scotland was introduced to the idea of self improvement through books by being allowed access to the private library of a wealthy industrialist in Pittsburgh. Young Carnegie vowed that if he every made a lot of money he would do the same later in his life. He wound up giving away approximately 70% of his vast fortune, mostly for creating his libraries. Of course, many of his workers wished he had created better working conditions and salaries in his steel mills while he was making his money rather than giving it to create libraries at the end of his life. We arrived at our first Carnegie library of the day in Allegheny. 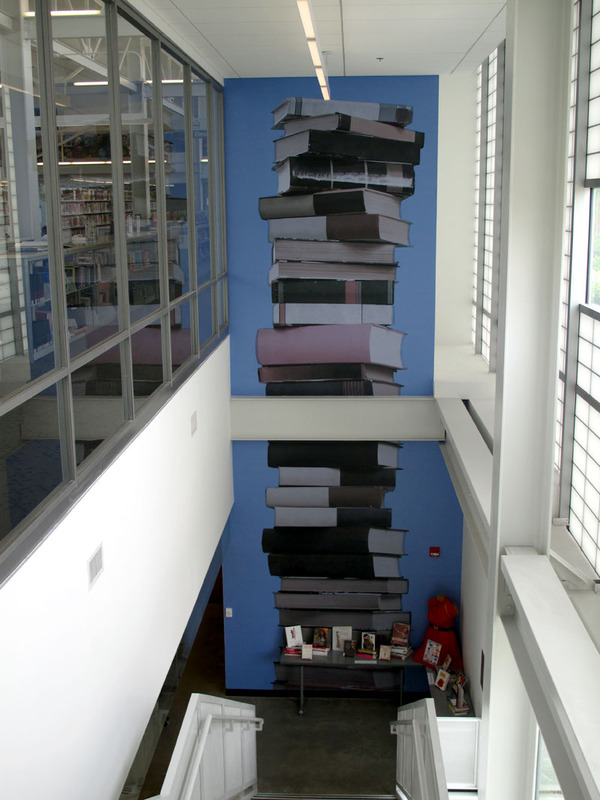 We were shocked to find a new, rather ordinary looking library. 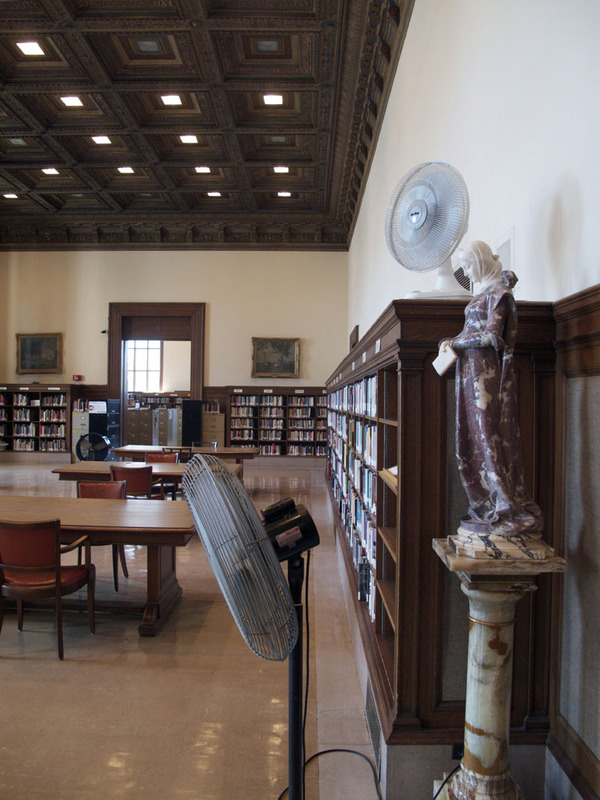 The librarian explained that the original Carnegie had been struck by lighting a few years ago and it had fried the library’s electrical system. 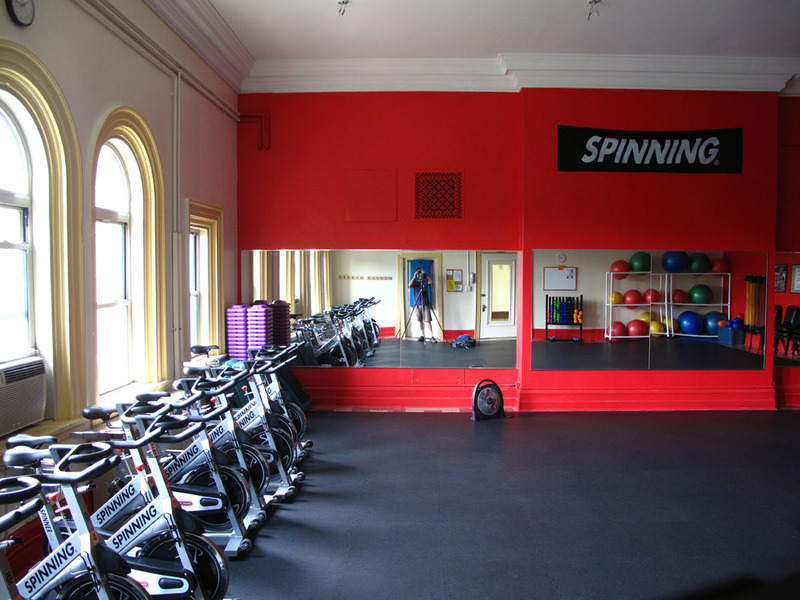 It now housed a Senior Citizens Center. We found it was closed and it looked abandoned. 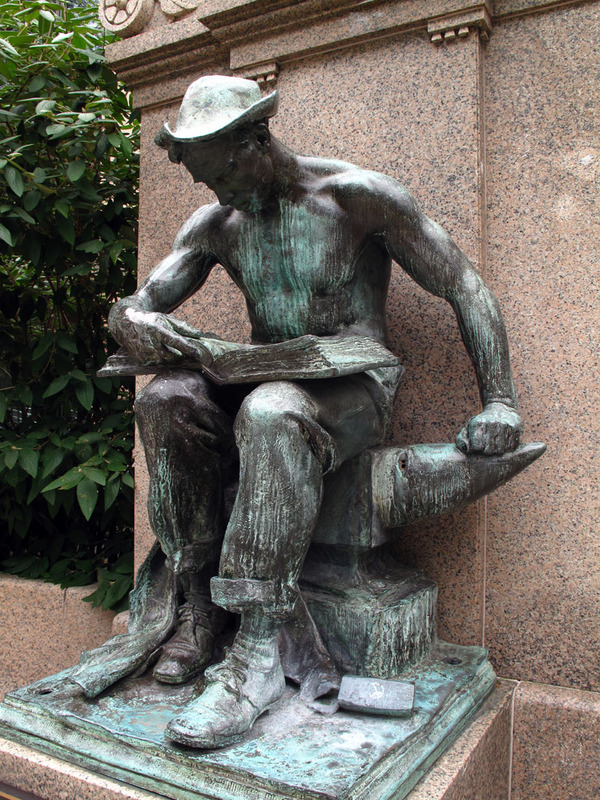 Outside was a statue that perfectly summarized Carnegie’s ideal for his libraries. It portrayed a bare-chested young worker sitting on an anvil reading a book. 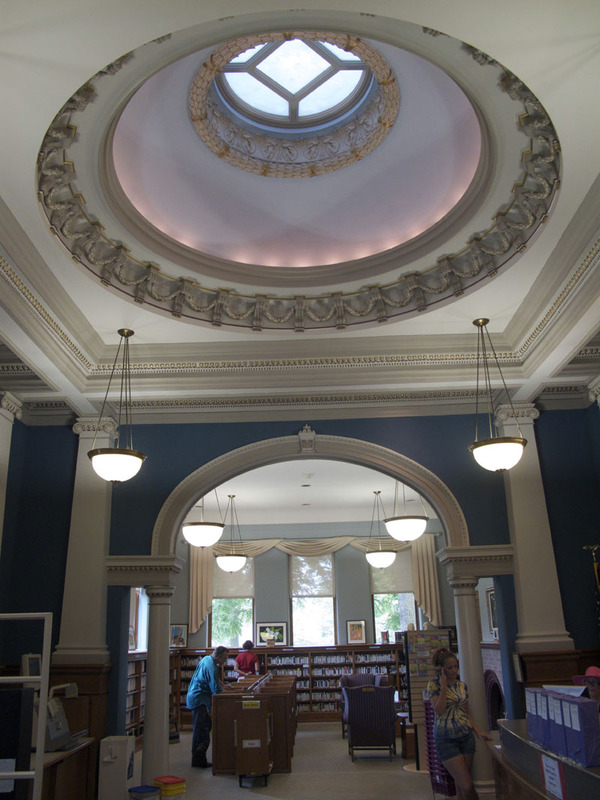 The Carnegie library in Homestead had all the elements of these early Carnegies including a concert hall, an indoor pool, an indoor gym and, of course, many reading rooms. Surprisingly, it had a hot, humid, run down feeling to it. When the steel mills shut down this area was left to carry on without the previous support. We finally arrived at the first American Carnegie library in Braddock. It was even more run down than Homestead and the librarian told me that the previous librarian had struggled to keep it from being closed. She gave me a wonderful tour and then turned me loose to photograph Carnegie’s vision and its decay in the heat and humidity. 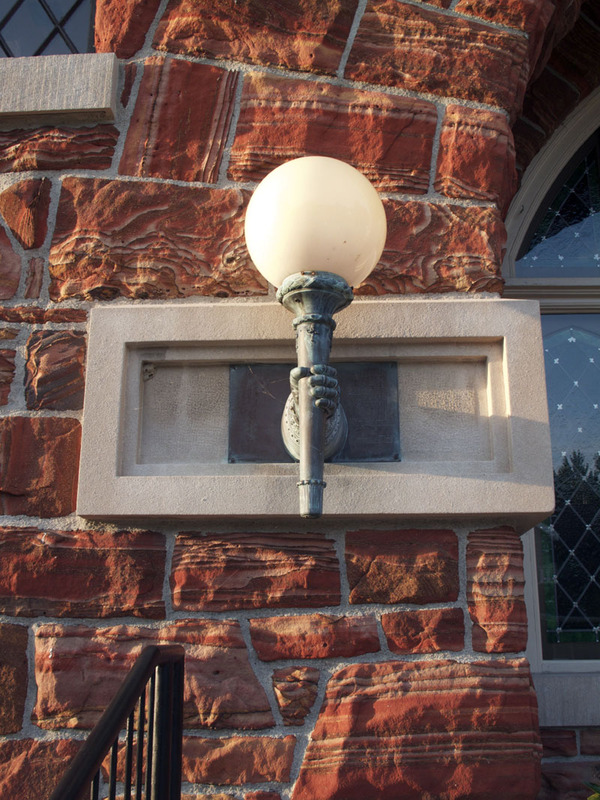 Walker and I decided to make a few, quick photos of the exterior of this important landmark. The street in front seemed sketchy but Walker was covering my back from the steps nearby. While I was under the dark cloth I saw a hand reach in and try to grab my 4X5 camera. I immediately grabbed the hand and shouted “Don’t do that!” I came out from under the dark cloth and was immediately punched in the jaw by an older, crazed, drug addict who thought I had taken his picture. I was stunned but Walker and I quickly screamed the guy down and he slowly walked away, muttering darkly. We were lucky that it hadn’t escalated into something worse. The librarian happened to drive by right after the fight and asked if we were OK. We sort of laughed it off but got out of Braddock ASAP. 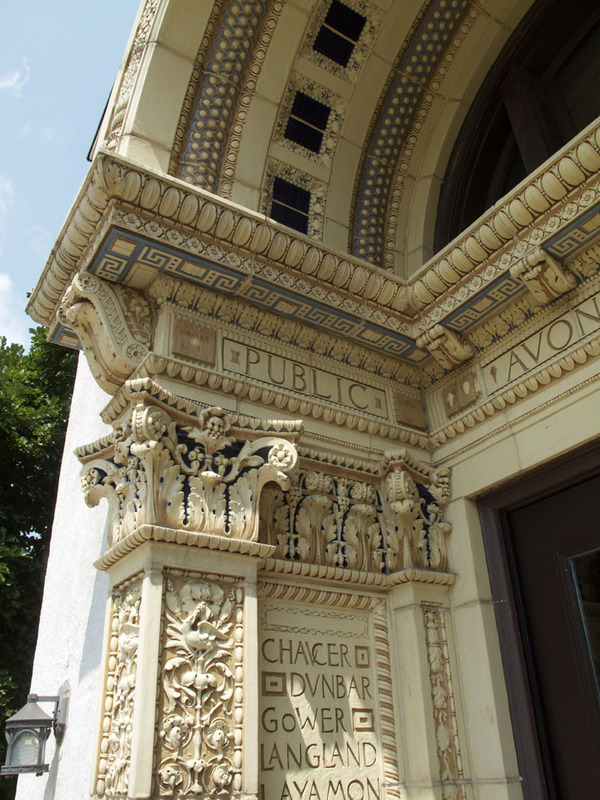 After photographing the McKeesport Carnegie we ended the day at the Main Carnegie Library in Pittsburgh. 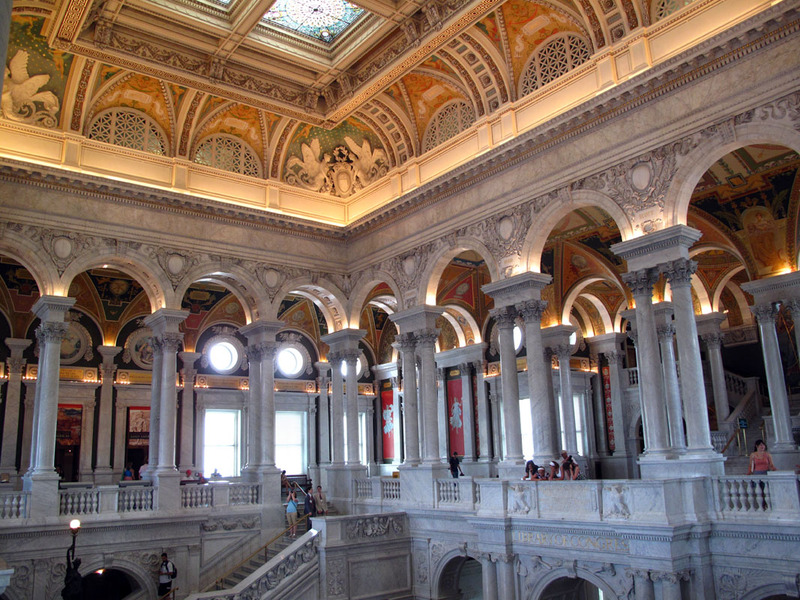 This is a beautiful, grand library that I didn’t have the time to do it justice. We ended this memorable day having a delightful dinner with my niece Phoebe Manchester and her partner Mary Burke. Although we are exhausted the fascinating conversation kept us up until the wee hours. 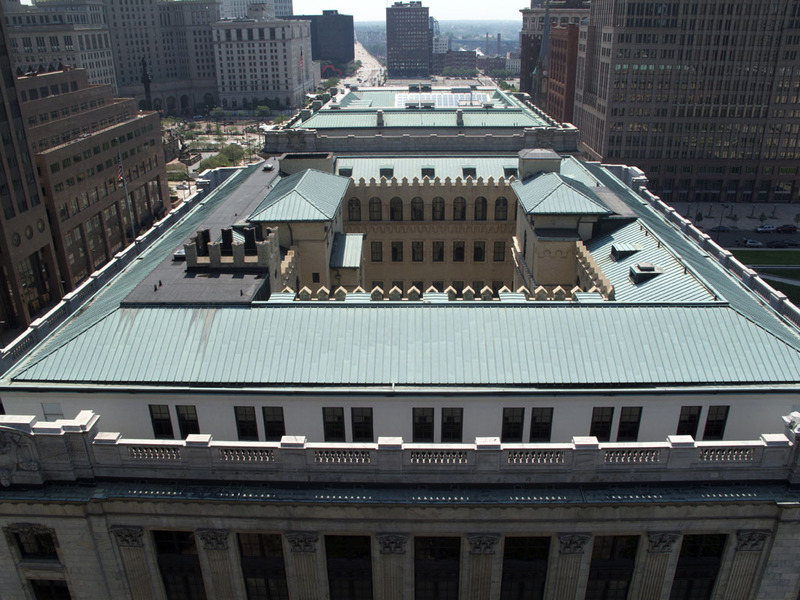 7/21/11 – Understandably, we had to go through several layers of security to be able to photograph in the Main Library in Detroit. However, it was worth it. 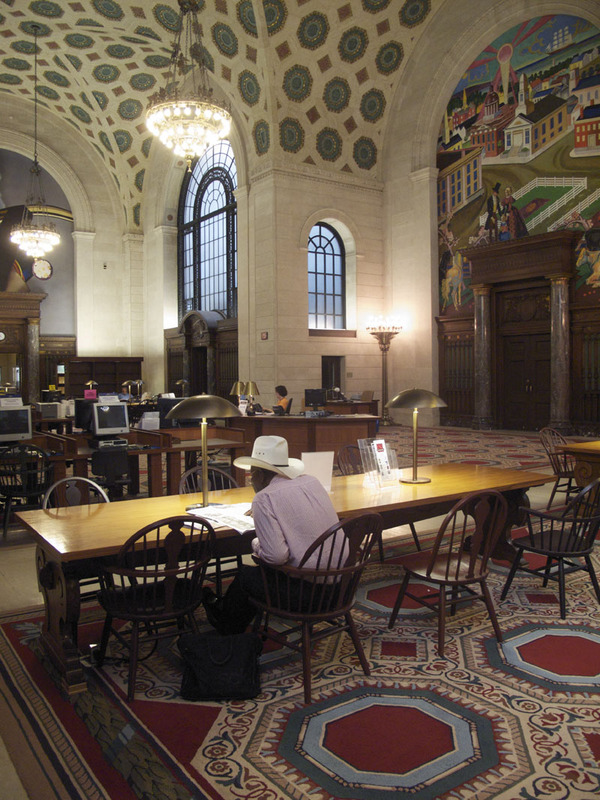 The library was built when Detroit had the intention of being a world class city. The sudden end of that dream had left a mostly devastated city with a top notch library. According to an article in Huntington Post 50% of Detroit’s population is functionally illiterate. Miles and miles of the city are in ruins. It is the poorest city in the U.S. and one of the most dangerous in the world. Librarian Jeanne Salatheiel took me on a quick tour that brought the library to life. 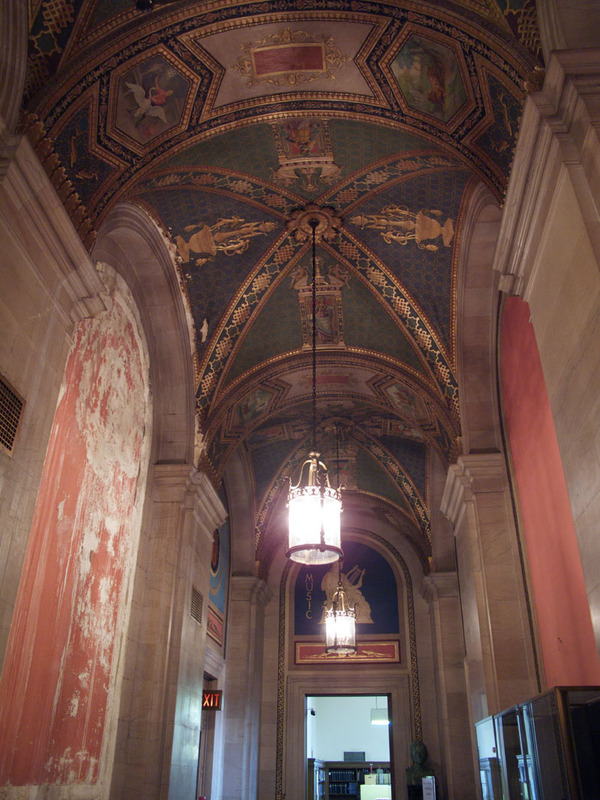 The grand hallways, the beautiful murals, the great collections collectively showed a portrait from another era. Today was the highest recorded temperature for any July 21st in the history of Detroit. Although the library had AC it was hot, even inside. I spent several happily hours photographing this great institution. We then plunged in to the record-breaking heat and humidity. 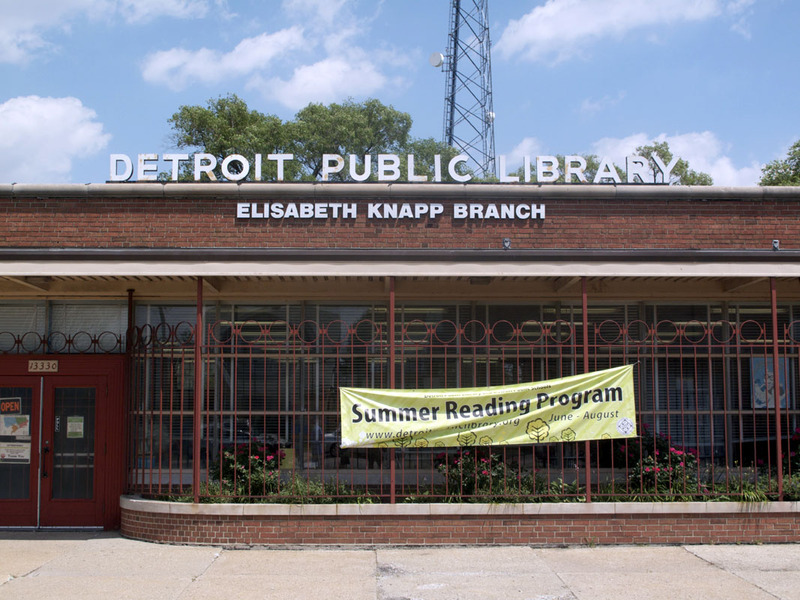 We photographed four branch libraries throughout Detroit. Two were abandoned and two were functioning. 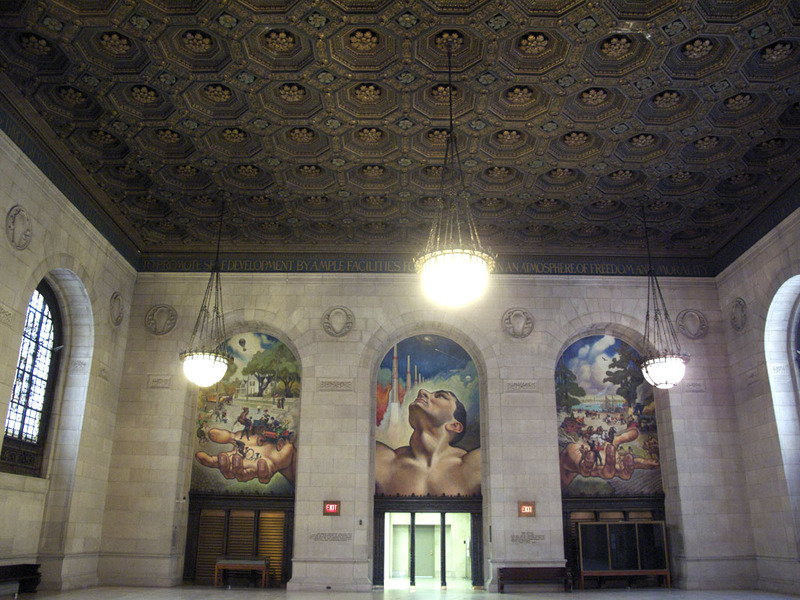 Every library in Detroit had an armed security guard that greeted us as we entered. 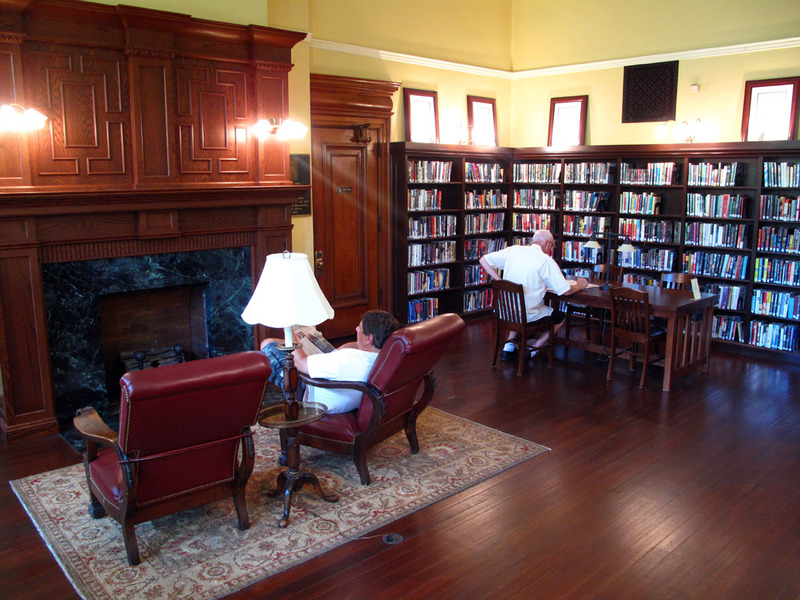 The Benjamin Franklin branch library was a refuge from the brutal heat and violence outside. Not surprisingly, it was filled to capacity. I spent an hour carefully photographing this tough but amazing place. One of the abandoned libraries was located next to a car wash. The owner of the car wash came out and explained that after the library closed it was a methadone clinic for many years before being abandoned. We headed back to our hostel in Windsor, Canada. We needed to escape the heat and chaos. We spent many hours working on our blogs and vlogs. Windsor surprised us for it normalcy compared to the insanity of Detroit. The two cities are only separated by the Detroit River but Windsor felt relaxed and European compared to where we had been. 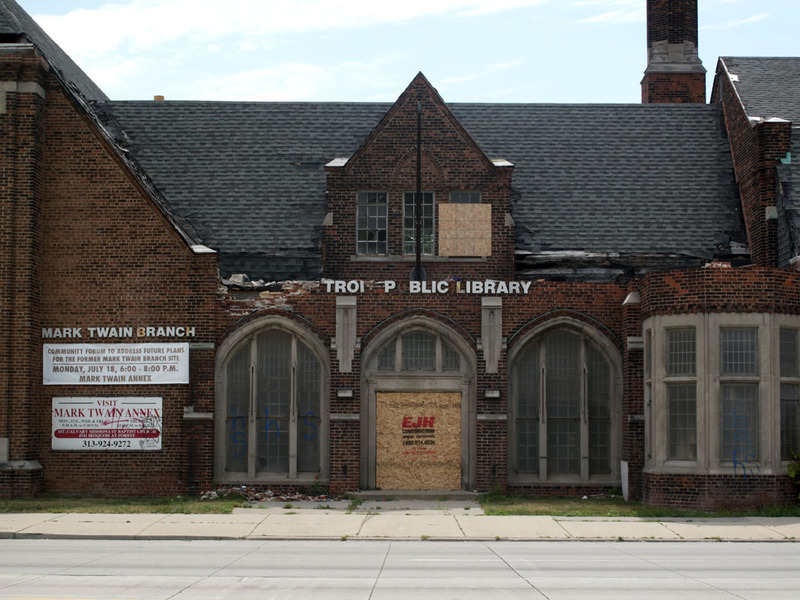 7/22/11 – After doing a quick tour of Detroit’s magnificent downtown core we continued to photograph branch libraries. 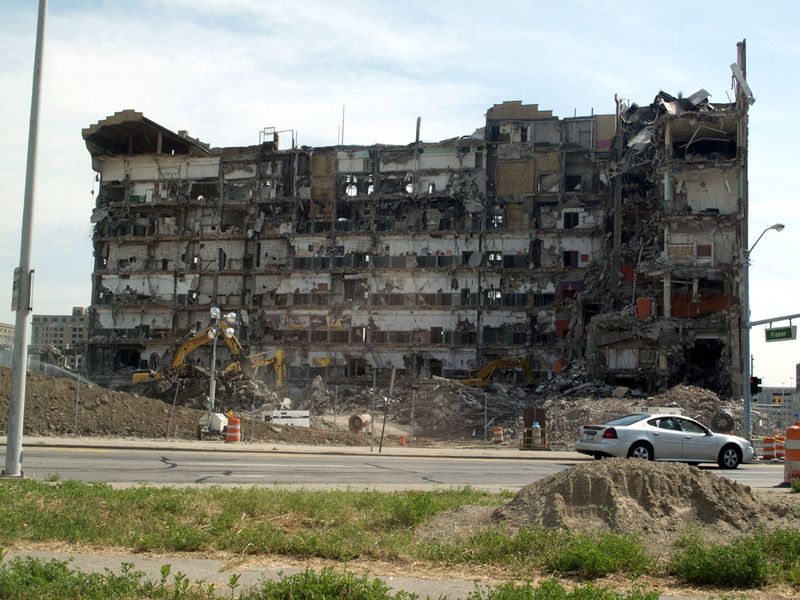 It was a good way of seeing a wide range of Detroit and we were amazed at the scale of the devastation. 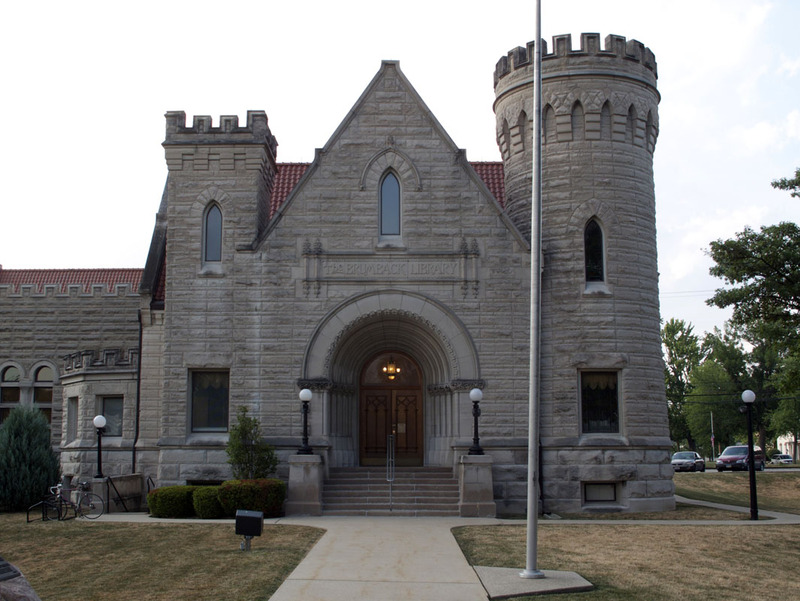 The Mark Twain branch library had been temporarily housed in the basement of a church for the last seven years. Today was slightly cooler than yesterday but the crowded library was stifling. 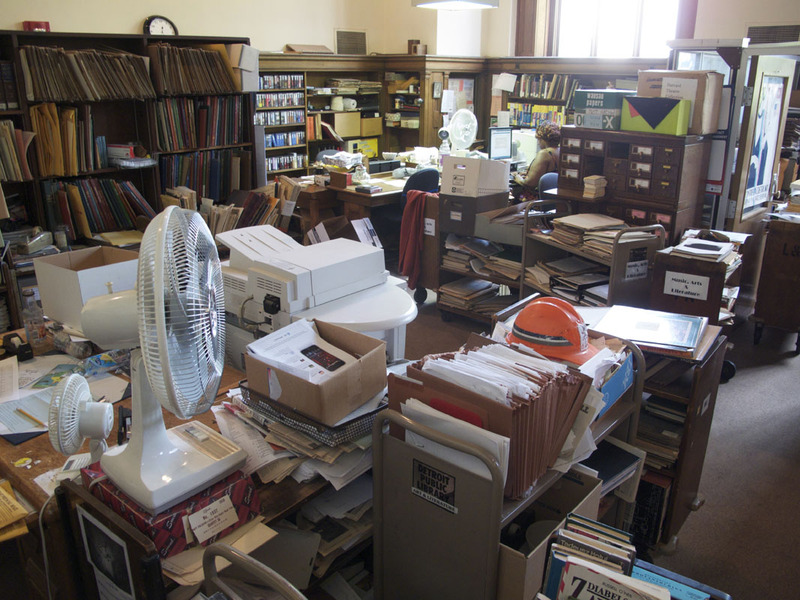 The AC had been broken for the last hew weeks during this record heat wave so large fans moved the air around the library. We drove to the beautiful but now ruined and abandoned original Mark Twain branch. Taken together the two will tell an interesting part of libraries in Detroit. 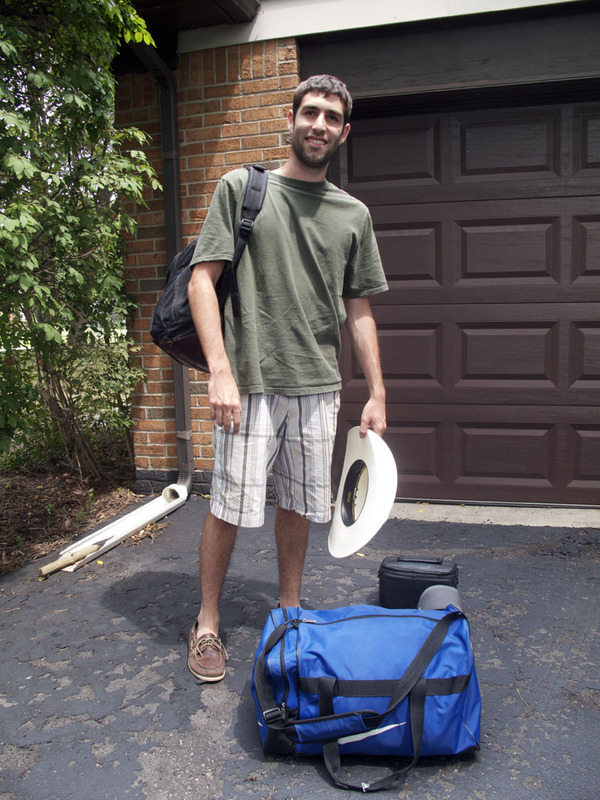 We sadly said good by to Nick after dropping him off at his grandfather’s house outside of Detroit. Later, I photographed the beautiful library in Howell, MI. It is located in what used to be the heart of the Michigan Militia Movement. 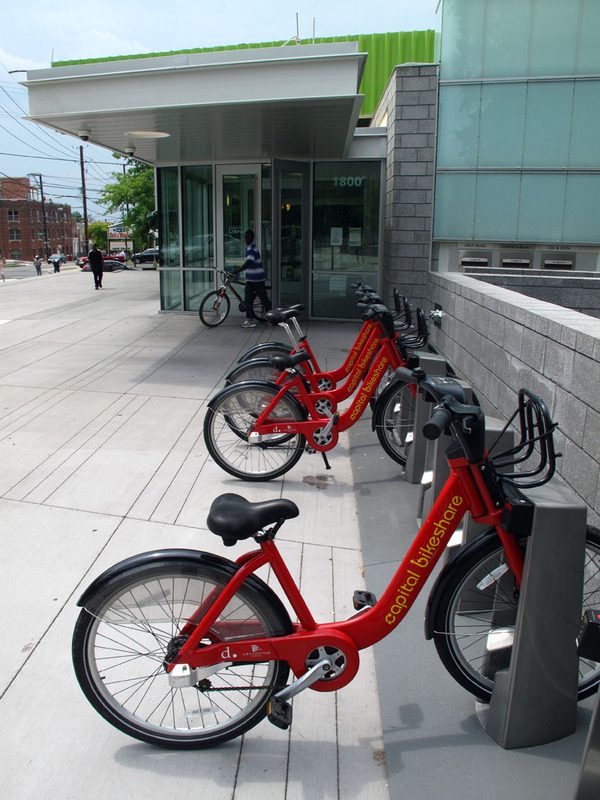 The downtown had been gentrified. We end our day in East Lansing where we stayed with the Amber family. Jake is Walker’s roommate in New York. Ben and Rachel have become new friends for us and we share a lot in common including politics. 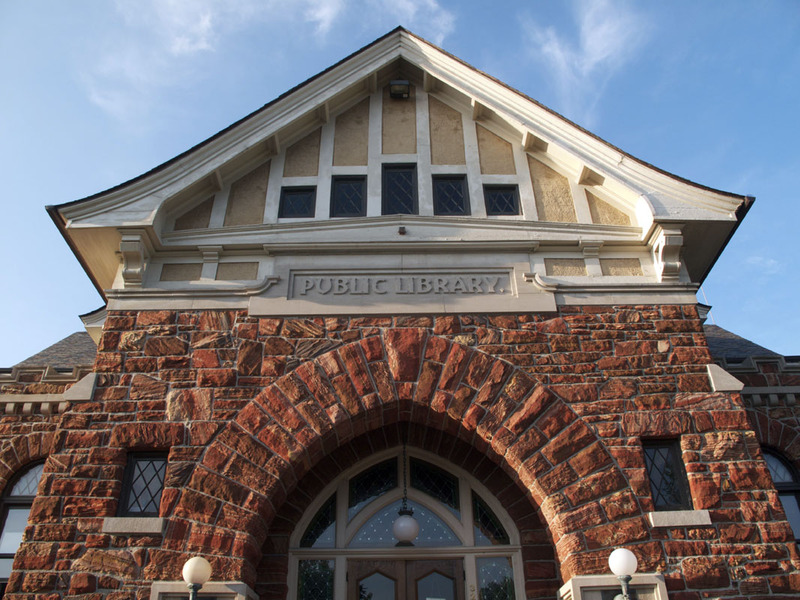 7/23/11 – We drove east for four hours stopping only to photograph a library in Norwalk, OH. We arrived at 3 PM in Cleveland and drove immediately to the Main Library downtown. Librarian Michael Ruffing took me on a wonderfully thorough tour of the seven floors of the new and old parts of this amazing library. 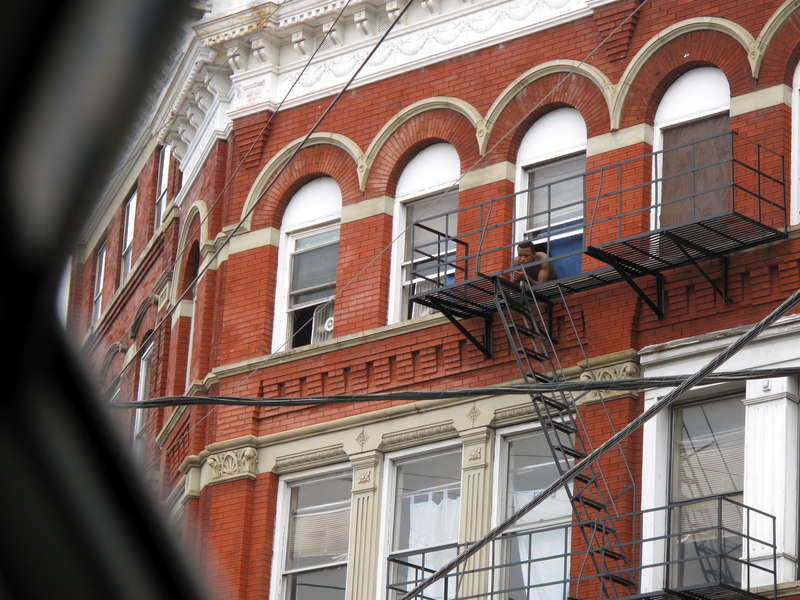 I was sweating carrying my 4X5 camera and tripod going up and down narrow staircases and even going to roof. His enthusiasm again brought the place alive. He turned me loose to spend the next 2 1/2 hours feeling like a kid in a candy store. 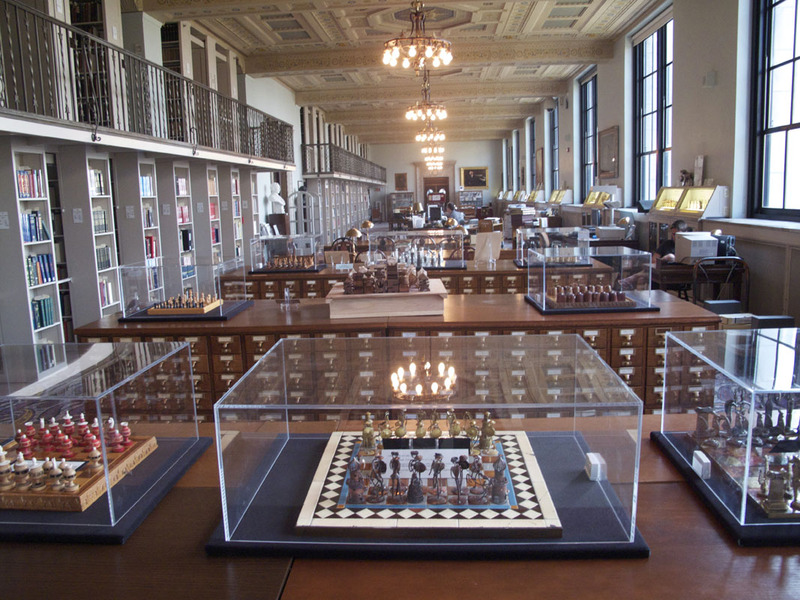 Cleveland’s library is one of the best so far. 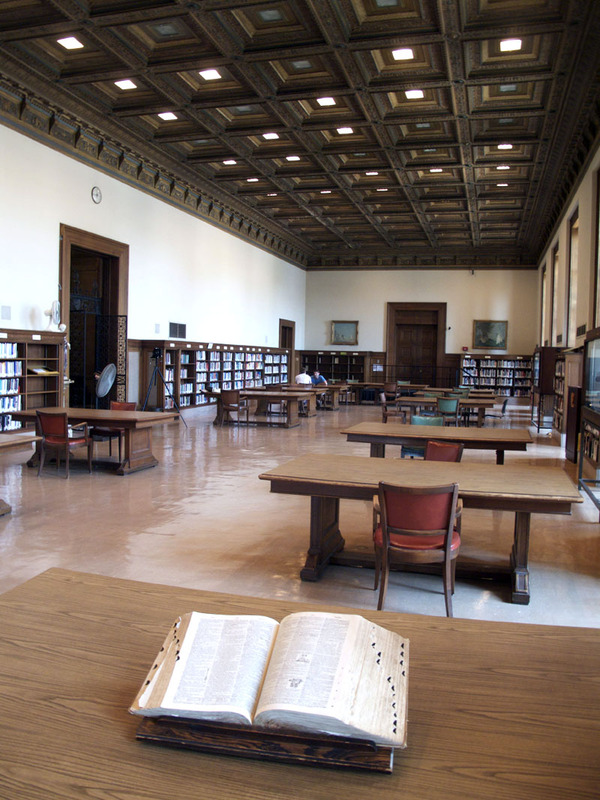 The quality of the library suggests a wealthier Cleveland in the past. It has suffered through hard times losing 2/3 of its population over the last 50 years. The flight of manufacturing jobs had hurt a lot of people here. However, Walker and I really liked the city and wish it well. 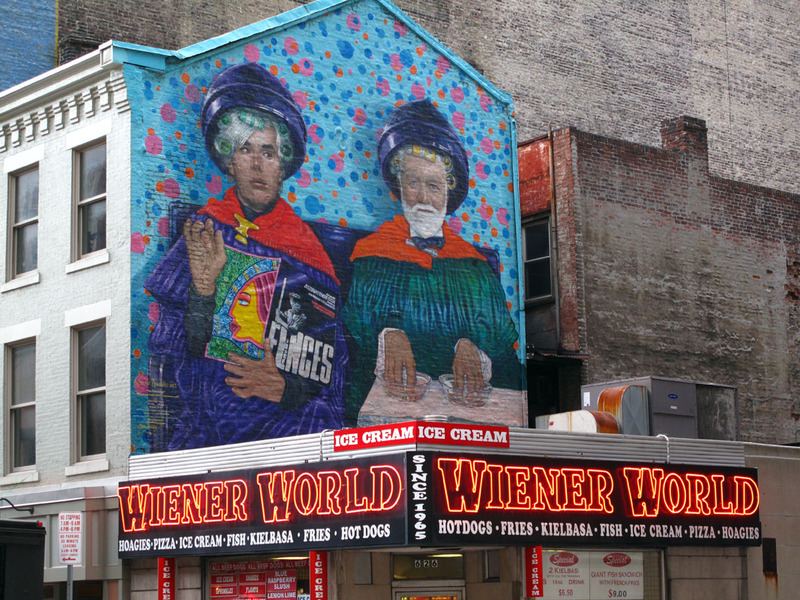 7/17/11 – Louisville is very impressive with its lively street life and beautiful middle-class neighborhoods. It even has Cherokee Park which was designed by Frederick Law Olmsted. On a slightly cooler overcast morning I photographed the Western branch library. It is a formerly segregated Carnegie library. When Andrew Carnegie built his libraries in the early 20th century Southerners refused to share their libraries with African Americans. So Carnegie had to build separate libraries for blacks. 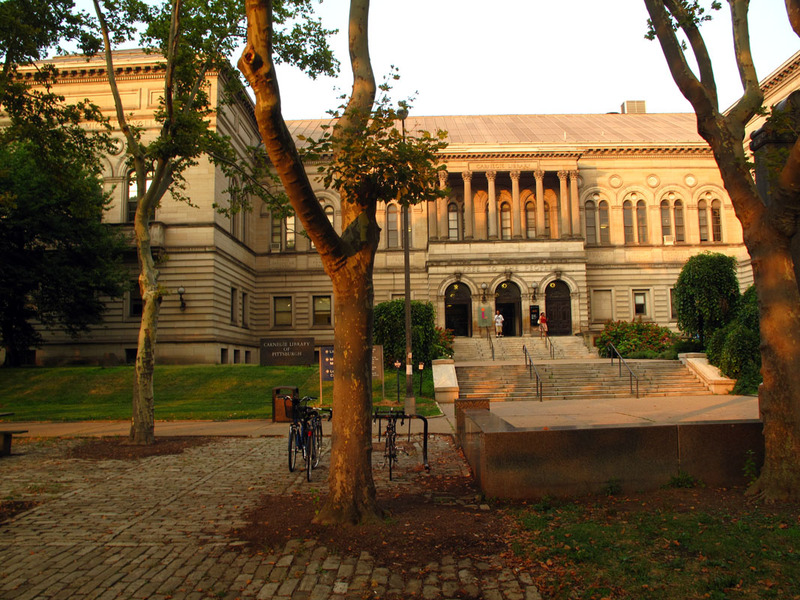 This is one of the few formerly segregated libraries left. 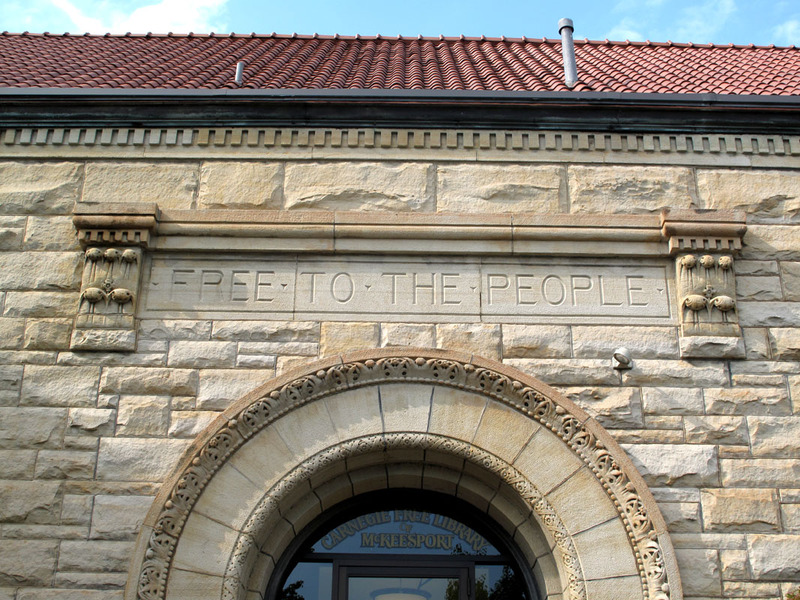 The Portland branch is unusual because it was built on a corner and has two entrances with a curved wall. Across the street was a memorial to a man recently killed on that spot. After photographing a third Carnegie library in Louisville we headed through the Daniel Boone National Forest to Shelbyville. It had a Carnegie built in a cemetery. We continued east and entered the foothills of the Appalachia Mountains. We are astonished by the rugged beauty and pockets of extreme poverty of the area. Some of the counties we drove through were some of the poorest parts of the country. The infrastructure was better here than in Mississippi. People were more isolated due to the extremely hilly geography. This was white poverty as opposed to the black poverty that we saw in the South. The government has obviously put a lot of money into building good roads. Boonesville, KY is located in Owlsley County , one of the nation’s poorest. The library is nice and new. It was set against one of the tall, pine covered hills typical of the area. A very dilapidated car was parked in front with a Dollar General store next door. Dollar General stores are trying to be the Walmart of poor communities. Being such a poor region we were surprised how well kept most of the this region seemed. The poverty was more tucked away into the hallars and back roads of the area. We stop at several small towns and the infrastructure, including libraries was in pretty good shape. We arrived in Harlan, KY and came to their library. Two curious local guys came by and posed for me in front of the library. It was one of the best shots of the day. The day ended with a much needed swim in the indoor pool in our motel. We then had dinner at a very good Mexican restaurant. We were surprised to see one here and happily chatted in English and Spanish with the staff who were all from Mexico. We told them that we felt almost as foreign as they did to this place . 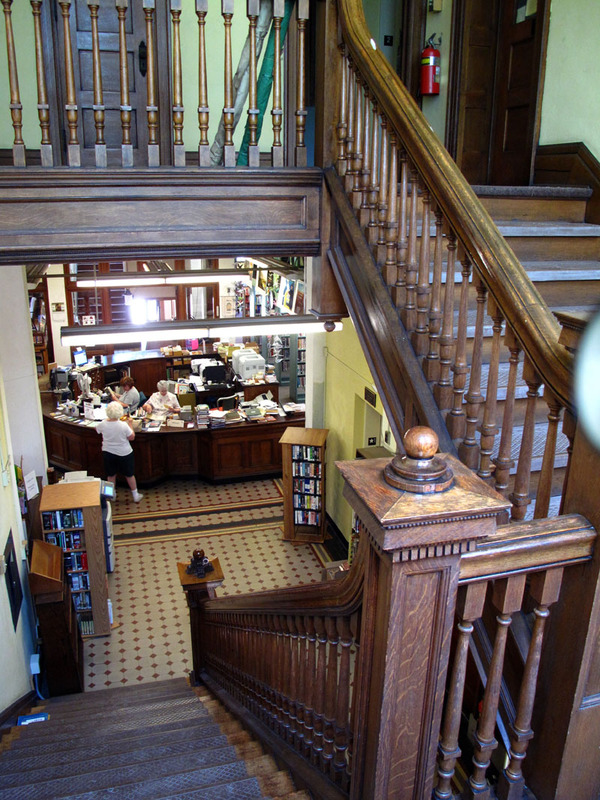 7/18/11 – This morning I photographed in the wonderful genealogy room at the Whitfield Library in Harlan. An old guy was curious about what I was doing and we started a nice conversation about Harlan. Fairly quickly he launched into a rant about Obamacare, the Democrats and taxes. After a while I stopped politely saying “uh huh” and quietly finished my photography and left. We drove east and visited many small libraries along the way. We made it all the way to Williamson, WV before turning back to Kentucky. In Williamson the library is combined with the Mungo County Health Department. After we went through a security check the library itself had some interesting photos and displays on coal, the main industry in the area. We had earlier seen an endless steam of big trucks and rail cars carrying coal. Inez, KY was again in a very poor region of the state. President Johnson launched his War on Poverty here in 1965. Since then, the government has spent billions of dollars in eastern Kentucky on transportation and education, including libraries. The poverty rate has been halved here since 1965 showing that focused government help can make a difference. We leave the Appalachia region and returned to regular America in Ohio. 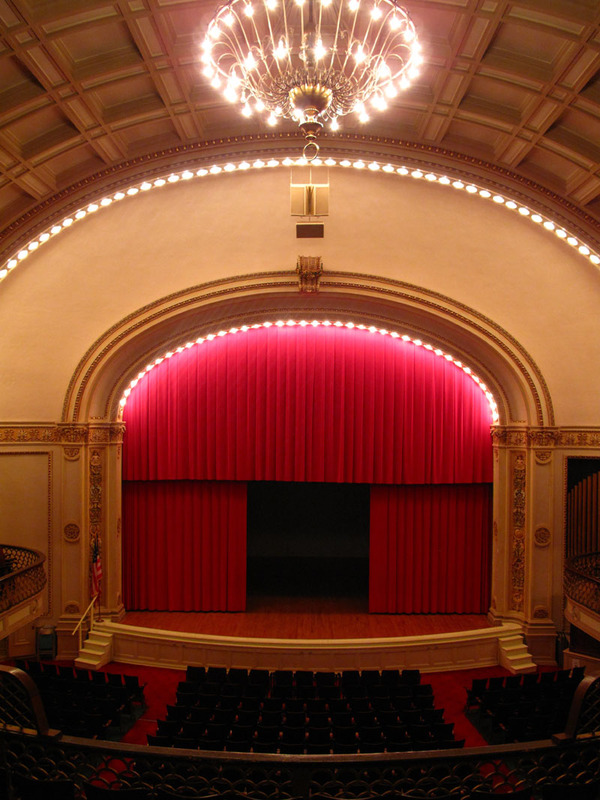 Portsmith had a beautiful, domed Carnegie in what seemed like a pretty depressed town. An amazing display inside was of suitcases for homeless people set up in the lobby. It was an interesting contrast with the picture-perfect library. The beautiful Ohio farmland led us to our last library in Lucasville. To better blend into the surrounding farm country the new library was built like a farm including a silo. Extraordinary. We push ourselves and finally reach Cincinnati. We spent the night with photographer/educator Barbara Houghton and her partner Keith. Although exhausted, we stay up until 1 AM talking with these fascinating friends. 7/15/11 – We had photographed the exterior of the new and old Carnegie combination library in Clarksdale yesterday evening. I wanted to see the interior and talk to the librarians today when they were open. The first librarian I met was Phillip Carter, the Reference Librarian. He was the outstanding blues guitarist we heard last night at Ground Zero. This confirmed the saying that real musicians have day jobs. He too enthusiastically brought the community alive. We discussed local history, notable personalities and, of course, music. 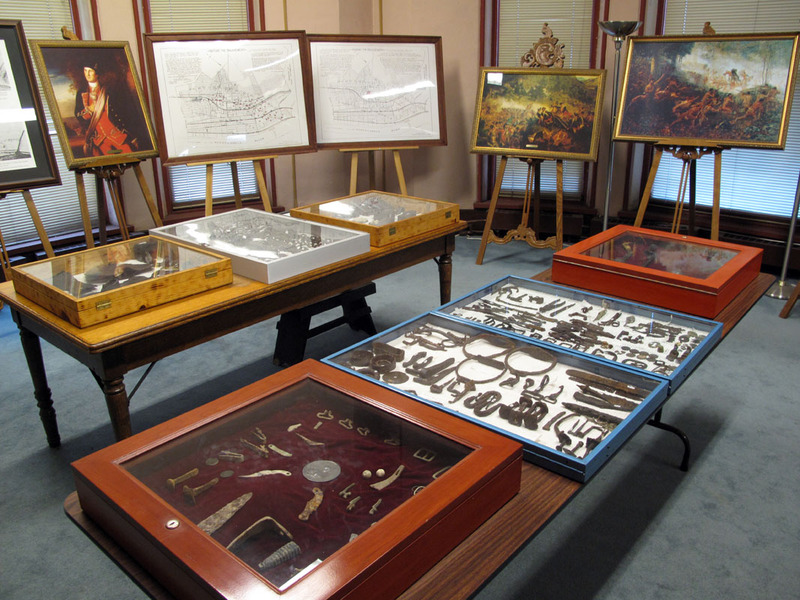 I advised him on archival storage of some of their decaying collection. He brought out a wonderful old photograph of a high school band. 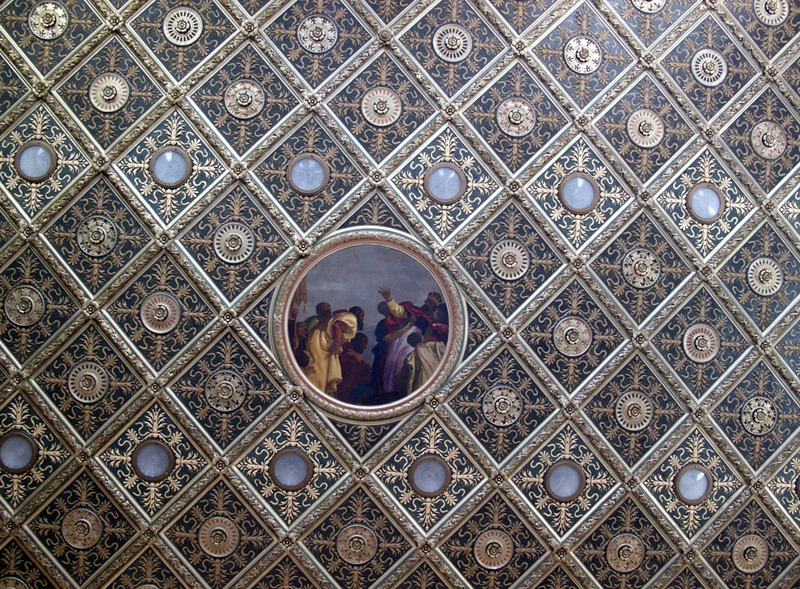 I took a photo of it in the fascinating Mississippi Room. I also photographed an incredible display of artifacts from the ancient Mississippi Mound culture. Upstairs in the Children’s Library I photographed a giant dugout canoe and some very beautiful stained glass, both by local artists. The wonderfully informative Children’s Librarian explained how the nearby Delta Blues Museum started as a project of this library and originally was housed in this room. Reluctantly, we pulled ourselves away from Clarkdale’s amazing library and once again hit the road. We drove north to Helena, AR where the librarian in their new library explained that they have the oldest continuously running library system in the country. The old library would have been too expensive to retrofit and brought up to code. It is now closed but I photographed this wonderful pink rock building attached to a museum. We left the Delta and transitioned to regular America in Oxford, MS. The nice roads and malls are a little hard to take after the Delta. I wanted to include in this project libraries in the home towns of great American writers. Oxford was home to William Falkner. Mississippi has produced many great musicians and writers. As I set up my 4X5 camera in a room full of books done by many of these great Southern authors, an old man with white hair wearing a white shirt and white shorts sat down in front of me to read the paper. The light reflected perfectly off his hair and fortunately he didn’t move during my 8 second exposure. This photo was an unexpected gift. We arrive at the Main Library in Memphis, TN just as they were closing. It was large, beautiful and new. I managed to make a nice shot of the front with large back-lit clouds above it. We drove through a very rough neighborhood to get to the South branch library located in a mall. Our last library was the Cossett branch library in downtown Memphis. It is a combination library with the old and new libraries connected. The old is quite beautiful and looks down on the Mississippi River below. The new library is probably more functional but looks like 1960s architecture run amok. We checked in to our motel and looked forward to a quick swim in the pool. However, we were very excited about our change of plans. Instead of staying in Cairo, IL tomorrow we decided to push on to Louisville, KY. That would allow us to drive through eastern Kentucky the following day. I posted a new blog while Nick and Walker worked on editing their film and photos. By the time we are done the pool was closed. We headed downtown for dinner on Beale Street. It reminded me of Burbon St. in New Orleans, but not quite as crazy. Lots of drunk people were wandering around but some good live bands played on the street. In our rush to find food we miss what looked like a really interesting photo exhibit on the 1968 Sanitation Workers Strike where Martin Luther King was killed. We drive home in the hot, humid night listening to the song “Its Hard Out Here For A Pimp” which was set in Memphis. We then work for another hour and collapsed asleep at 1 AM. at the Willard Library at 3:30 so I had an hour and a half to photograph the most beautiful library so far. In addition it is the only library that is haunted. We are told that the ghost likes to hang out in the basement and in one corner of the third floor. I think I see her but I’m not sure. The library is incredibly beautiful and I had to carefully pace myself to be able to photograph all of the interior before closing time. Right at 5:00 I exited the library and proceeded to spend another hour photographing the amazing exterior. 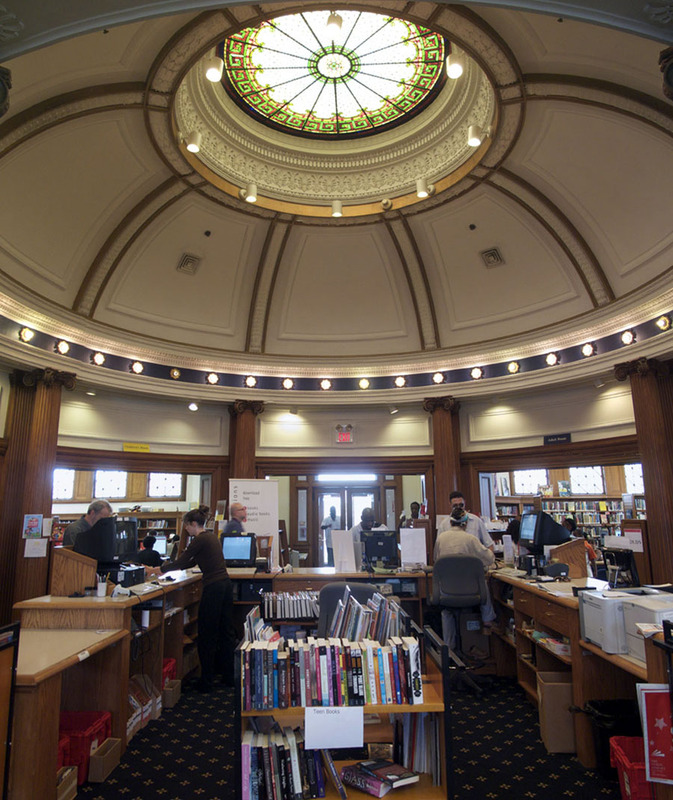 This library and a few other civic buildings downtown suggest a wealthier, more exuberant Evansville than we see today. Walker and Nick felt this is the least interesting town so far. 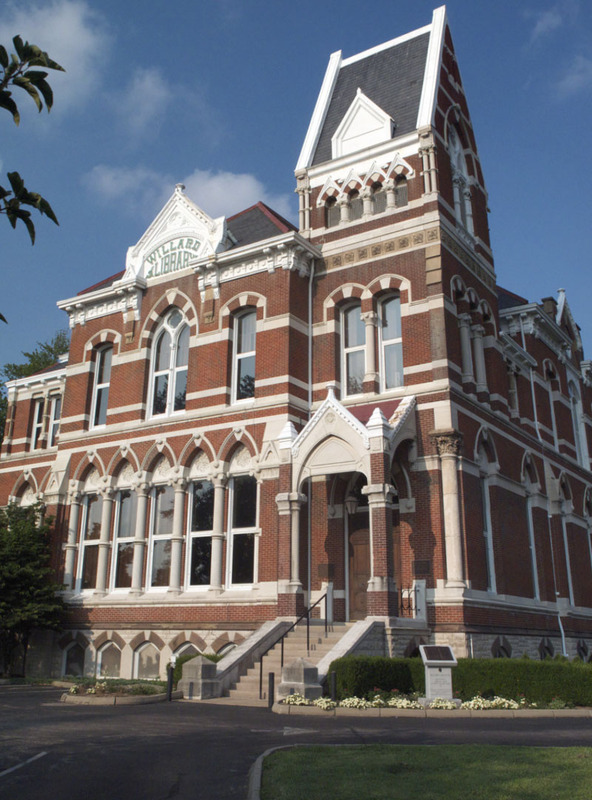 We drove several more hours through beautiful rolling farmland to Louisville, KY.
7/13/11 – The library in Yazoo City, MS is one of the most amazing libraries on the trip. We wanted to spend the whole day here but I limited it to about 2 1/2 hours. 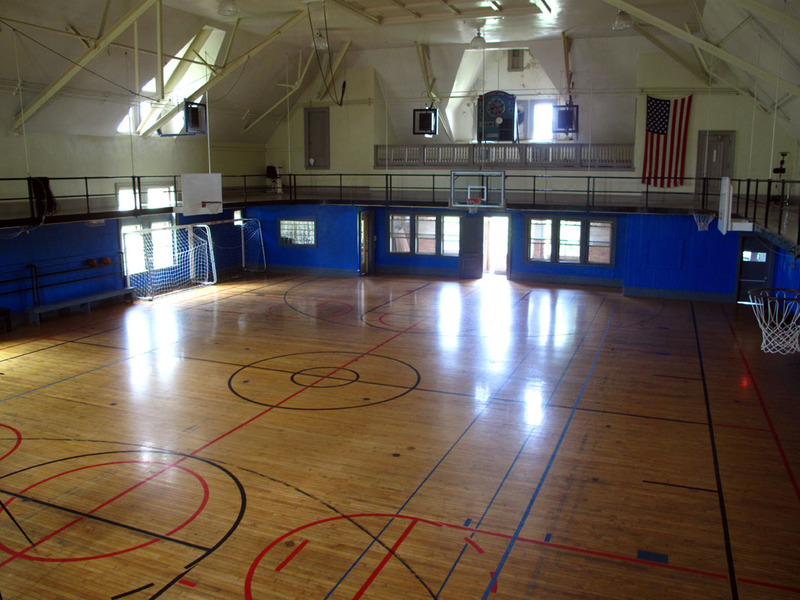 Built in 1900 the interior of the B.S. Ricks Memorial Library is both stunning and old, spacious yet small, a keeper of local history but also filled with people using computers. The local historian and librarian was like Shelby Foote in Ken Burn’s Civil War series. He made Yazoo City’s history come alive. All the floods, fires, and local citizens became significant to us through John’s beautiful Southern voice. He even told the story of the 19th Century witch that cast a curse on the town before the citizens killed her. The curse came true when the town burned on the day she predicted. He then introduced me to an older, distinguished looking woman who convincingly preforms the historical role of the witch to local groups. She took Nick and Walker out to lunch and introduced them to the local town leaders and newspaper reporters. 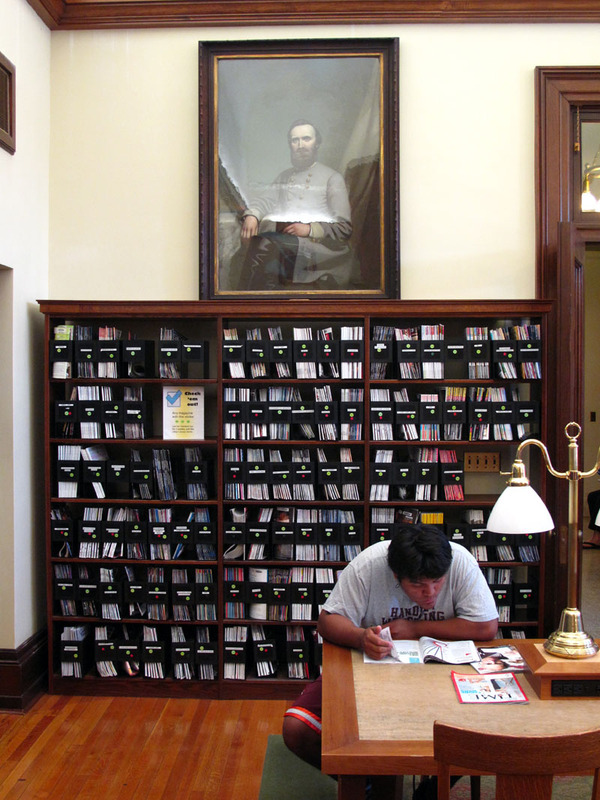 I stayed and continued to photograph all aspects of the Ricks library. We drove from one of the best libraries of the trip to the Tchula library in the poorest county in the poorest state in the nation. The library was open but the lights were off and the AC had been broken for a year. The librarian was very nice but it was stifling inside. We drove on to Belzoni which calls itself the Catfish Capitol of the World and has the highest rate of childhood poverty in the U.S. The whole town has colorful catfish sculptures but the librarian said most of the catfish production is gone. Belzoni was also the site of bitter civil rights struggles in the 1950s and 60s. Known as “Bloody Belzoni” for the uninvestigated and unsolved murders of civil rights pioneers. Despite the poverty it elected its first African American Mayor in 2006. In the tiny town of Arcola the African American librarian was excited to pose in front of the library. When she smiled, her gold grill sparkled. Greenville and Leland showed us two Mississipppis. One black and poor and one white and relatively well off. As the sky darkened with an approaching thunderstorm we drove into the small Delata town of Indianola, home of B B King. 7/12/11 – Natchez is charming and one of the jewels of the South. The Judge George W. Armstrong library was damaged by a hurricane a few years back and had a faded grandeur on the outside. The librarians were very excited about our project. They took our photograph and later post a story about us on Facebook and on the library web site. Nick and Walker did an excellent interview of one of the librarians that is only slightly marred by the sound of the fans running in the background. She explained that the AC goes off a few times a week during this heat wave because of the power outages. The library then has to close. The heat wave has been going on since early June. As usual, the library is packed today. We drove north to the tiny town of Fayette. 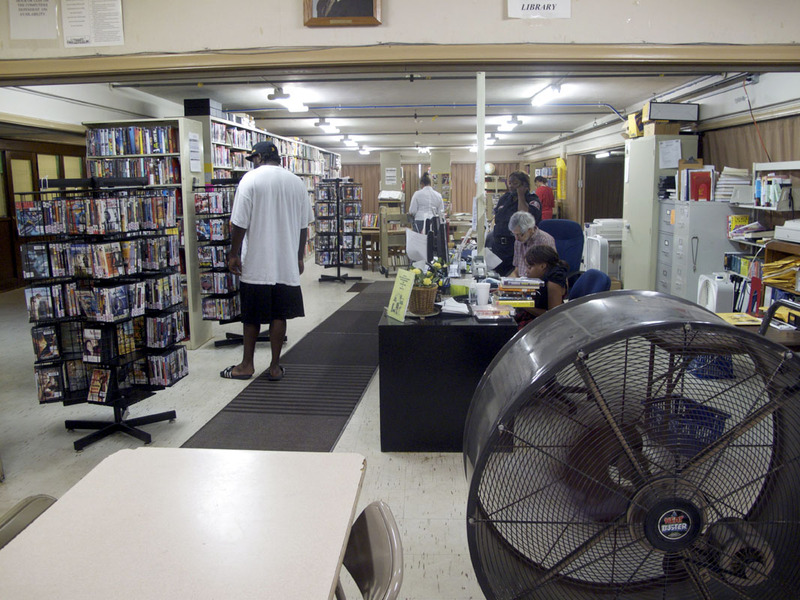 The Jefferson County library is located in one of the blackest counties in the US and one of the poorest places in the country. It has the highest illiteracy rates in Mississippi. It would rank below Nigeria and slightly above the Congo for its illiteracy. 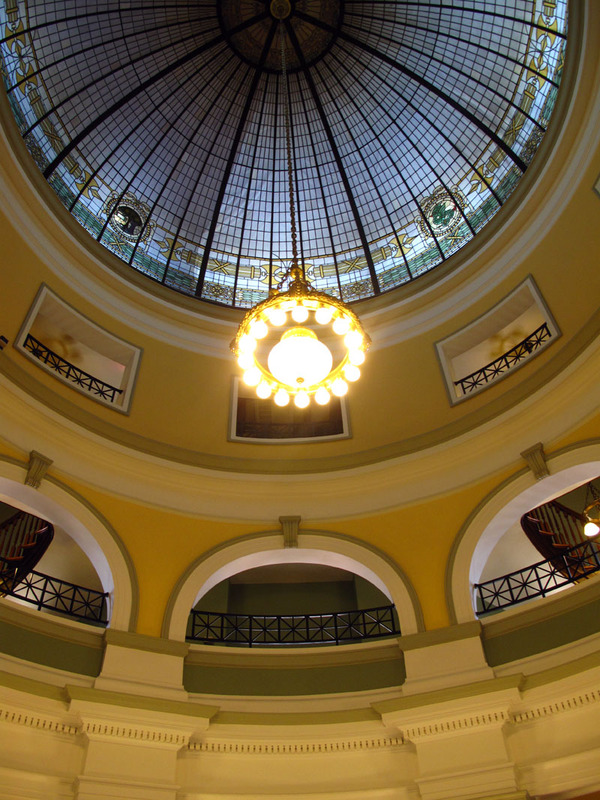 The library is one of the only places in town that gives people access to another world. We decided to use the rest of today to slow the trip down and work on editing. We check in to our motel in Jackson and Walker and Nick quickly go to work on their vlogs. I decided to check out four branch libraries named after civil rights pioneers. As I drive up to the Fannie Lou Haner library the sky opens. Thunder, lighting and Biblical floods are everywhere. It was even too wet to open the car window for a quick shot, let alone to run inside the library. I drove to the Medgar Evers branch library but it was still pounding rain and I couldn’t find the library. At that point I gave up and headed back to the motel. The rest of the afternoon and evening were spent editing and blogging. We took a break at night to run downtown to another great meal at a classic Southern Cafe. It was a chilly and humid 79 degrees outside and far cooler inside. For the first time on the trip we feel cold. Here is an interesting article that we found regarding poverty in Lake Providence, Louisiana where we just photographed their local library.